Egypt has one of the world’s oldest postal systems, possibly the oldest if one counts the methods used to transport letters and other items during the ancient Egyptian period. 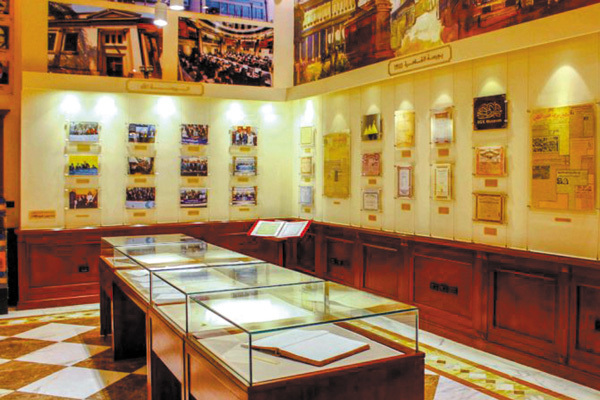 It also has one of the world’s oldest dedicated postal museums presenting this history to wider audiences in the Egyptian Postal Museum housed in the main Post Office building in Ataba Square in Downtown Cairo. However, this history, already well known among philatelists and stamp-collectors worldwide, may not at present be appropriately exploited. The Egyptian Postal Museum in particular, housed in an important heritage building in an area slated for restoration as part of the Khedival Cairo Conservation Area, could be a much more significant destination than it is at present for visitors to Cairo and particularly for those interested in the 19th and 20th century architecture of the modern historic centre. There are also major opportunities for developing the collection of this intriguing museum, perhaps unique across the Middle East, which was founded in 1934 to house parts of the personal stamp collection of King Fouad, like the UK’s King George V an avid collector of postage stamps, though most of the Egyptian royal collection was auctioned off after the country’s 1952 Revolution. 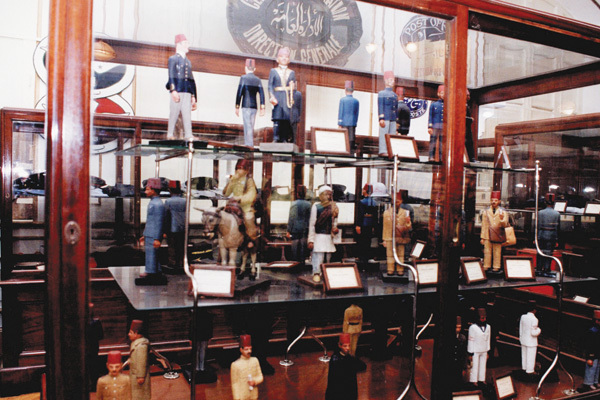 The museum was also intended to present the development of Egypt’s postal system within the framework of the wider modernisation of government and other structures from the Mohamed Ali period onwards. Visiting the museum on a weekday afternoon, Al-Ahram Weekly found the historic Post Office full of patient customers, the explosion of Internet messaging over recent years apparently having done little to dent the traffic in physical letters and perhaps particularly parcels. Having bought a ticket from a regular counter downstairs in the historic Post Office building, visitors make their way upstairs where they may well be confronted by a rather different scene. 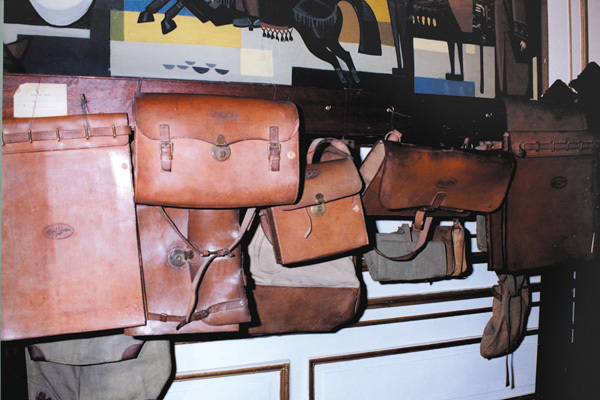 Despite the comprehensiveness of a collection that in addition to postage stamps also includes displays on postal technologies and associated paraphernalia such as letterboxes, postmen’s uniforms, mailbags, and even modes of transport including boats, cars and trains, the museum seemed poorly frequented. There seemed to be an overall atmosphere of neglect that contrasted radically with the unfailing courteousness and helpfulness of the staff. There also seemed to be an absence particularly of earlier series of Egyptian stamps, which is a pity given the long history of the Egyptian Post Office. According to the generally accepted history, the modern postal system in Egypt was established in 1821 during the rule of Mohamed Ali and when the country was still part of the Ottoman Empire. This was a private concession called “Posta Europea” operated by an Italian businessman, and it was later extended and awarded the concession to operate all inland postal services in 1857. In 1866, the government of the Khedive Ismail took over the concession and founded the Egyptian Post Office, with the country’s first stamps appearing in 1867 and printed in Genoa in Italy with the name of the country and their value printed in Arabic over an ornamental background. A further series established the format for many of those that followed, with six values (a five paras yellow stamp to five piastres in brown) featuring images of the Pyramids and the Sphinx and using only Arabic script. An 1872 series then followed of seven values, with the words “Poste Khedive Egiziane” appearing in Latin script and signaling the influence of Italian. In 1879, a more elaborate and more extensive series appeared. This still showed the Pyramids and the Sphinx, but it set these monuments in different frames, with “Postes egyptiennes” appearing in French to replace the earlier Italian words. Another such series appeared in 1888, again featuring the Pyramids and the Sphinx set in various frames. The first major change took place only in 1914 when an entirely new series appeared bearing more elaborate designs and the words “Egypt Postage” in English to replace the earlier French inscription. Probably this change echoed Egypt’s changing political status at the beginning of World War I when the country was formally detached from the Ottoman Empire and became a sultanate under British protection. The 1914 series again emphasises the country’s ancient heritage, with Cleopatra, the Colossi of Amenhotep III at Thebes, the colossus of Ramses II, and the monuments of Abu Simbel appearing in addition to the Pyramids and the Sphinx. Perhaps in a nod to the country’s Islamic identity, the Cairo Citadel now appeared on the 50 milliemes stamp, with the Old Aswan Dam also appearing on the highest value of the time of 200 milliemes. Developments in Egypt’s political history were coming thick and fast, and these were reflected on the country’s stamps. In 1922, the 1914 series was reissued with the words “Kingdom of Egypt, 15 March 1922” thickly overprinted in black together with a royal crown. In 1923, an entirely new series was produced showing a portrait of King Fouad. Paras and piastres had disappeared from the stamps by this time to be replaced by milliemes and pounds, with the higher denomination stamps in the 1923 series being of a larger size. On the smaller denominations, the king wears a tarboush and a collar and tie. The one pound stamp shows him wearing the military uniform. A VICTORIAN EPISODE: Stamps, like currencies, have long served as vehicles for the expression of national identity and for signaling changes in history or political regimes. Like coins or banknotes, they have often been used for iconography including symbols of a nation or images of its ruler. Egyptian stamps have been no exception to this rule, with the early series establishing a repertoire that included ancient Egyptian as well as Islamic scenes, along with, more belatedly, a definitive series that included portraits of the country’s ruler. The 1914 series also illustrated the country’s modern achievements with an image of the Old Aswan Dam. However, the story of Egypt’s postage service also has many fascinating by-ways, including a now little-known visit to the country in 1858 by the Victorian novelist Anthony Trollope to advise the government of the then Khedive Said Pasha on the country’s overland postal routes. Better known as the mid-Victorian author of comforting tales of English clerical and political life, Trollope was also an employee of the British Post Office, where he was responsible for modernising the postal service in Ireland. Trollope arrived in Alexandria in February 1858, where he had been sent, according to modern biographer Victoria Glendinning, “to find out whether bags or metal boxes were more suitable for sending mail across Egypt, and, more importantly, to negotiate with Nubar Bey the use of Egyptian railroads, instead of camels, for British mail bound for India and Australia.” At this time Trollope, still establishing himself as a novelist with the first in his Barsetshire series of novels on English country life, was engaged in writing the book that was to become the basis of “his solid, undisputed success”, in his biographer’s words. It was this novel, Doctor Thorne, that Trollope wrote on the boat to Egypt and presumably also in odd moments during his negotiations with Nubar Bey. It is a typically Victorian saga of a penniless young woman who grows up with her rich aunt and cousins before inheriting everything and marrying the son of a local aristocrat. It contains few if any echoes of Egypt. According to the account Trollope gives in his Autobiography of his negotiations with Nubar Bey, the postal mission was also a success. Nubar Bey was in fact Nubar Nubarian, later Nubar Pasha and three times prime minister of Egypt under the khedives Ismail, Tawfik and Abbas Helmi from the 1870s to the 1890s and one of the major political figures of the time. “I never went to his office, nor do I know that he had an office. Every other day he would come to me at my hotel, and bring with him servants, and pipes, and coffee. I enjoyed his coming greatly… but on one point he was firmly opposed to me. I was desirous that the mails should be carried through Egypt in twenty-four hours, and he thought forty-eight hours should be allowed,” Trollope wrote. When Trollope arrived in Egypt in 1858, the India mail was still being carried overland to Suez by camels in boxes, safer, Trollope says than having it carried in bags. However, with the building of the railway line to Suez, completed later in the same year, it became possible to send the mail by train in a much shorter time, and perhaps it was the scheduling of this that caused the temporary friction between Trollope and Nubar Bey. In any case, 24 hours was finally agreed, and Trollope finished writing Doctor Thorne in Egypt on 31 March, having written the allotted number of pages every day according to the unromantic methods of composition detailed in his Autobiography. Trollope visited the Pyramids at Giza, Saqqara, “the howling dervishes at Cairo”, as he describes them in a letter, together with the Cairo Citadel, the Sultan Hassan Mosque, and “the tombs of the caliphs”, possibly the Mameluke tombs in Cairo’s cemetery area, while he was in Egypt. According to Glendinning, Trollope’s Egyptian visit left marks on his writing in the shape of two short stories, “An Unprotected Female at the Pyramids” and “A Ride across Palestine”, and he came into contact for the first time with British tourists in foreign parts. One man, encountered in a hotel in Suez, he describes as suffering from “that terrible British exclusiveness, that noli me tangere [don’t touch me] with which an Englishman arms himself” abroad. KINGDOM OF EGYPT: During the Kingdom of Egypt (1922-1953) and under its two kings Fouad and Farouk, Egypt’s stamps became more colourful and more adventurous, with many commemorative and other designs marking the new regime off from those that had preceded it. In 1925, a special commemorative series was issued marking the International Geographical Congress in Cairo, including a five millieme stamp showing the ancient Egyptian god Thoth writing the name of King Fouad in hieroglyphs in a royal cartouche. There was a special issue in 1926 to mark the king’s birthday, and in the same year a series was issued to mark the opening of Port Fouad opposite Port Said at the mouth of the Suez Canal. Further commemorative stamps followed. In 1936, a special series was issued marking the 1936 Anglo-Egyptian Treaty and featuring the Egyptian delegation to the negotiations led by then prime minister Mustafa Al-Nahhas Pasha. A more extensive definitive series of 1937 marked the investiture of the new young king Farouk, followed, in 1938, by a five milliemes special stamp marking the royal wedding of King Farouk and Queen Farida. A 1940 stamp carried an image of the 18-month-old princess Ferial, followed in 1944 by a full series showing Farouk in military uniform. 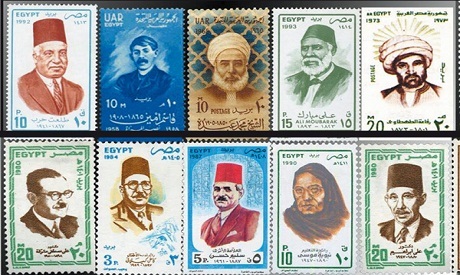 Like in the period after World War I, developments in Egypt’s political history after World War II came thick and fast, and they were often marked in the country’s stamps. A special issue in 1945 marked the foundation of the Arab League, followed in 1946 by stamps to mark a visit to Egypt by the king of Saudi Arabia and a series to mark 80 years of Egyptian postage stamps and showing the Khedive Ismail and kings Fouad and Farouk. 1947 saw stamps issued to mark the withdrawal of British troops from the Nile Delta. 1948 saw others marking the entrance of Egyptian troops into Palestine in the 1948 War, and in 1951 another royal wedding stamp appeared, this time of King Farouk and queen Nariman. The final years of the monarchy saw the overprinting, in 1952, of the 1947 definitive series with the words in Arabic “King of Egypt and Sudan, 16 October 1951” marking a new agreement with the British. The abrogation of the 1936 Anglo-Egyptian Treaty in October 1951 was marked by special stamps, as was the birth of crown-prince Ahmed Fouad in 1952. Later in the same year, the first stamps of the new regime appeared, with a series marking the 23 July Revolution. The iconography changed, and a 1953 issue saw the reissue of various series showing King Farouk with the former king’s face overprinted and obliterated by three horizontal bars. Looking through the subsequent pages of the Stanley Gibbons International Catalogue for Egypt, a standard reference for everything to do with stamps, readers may be struck by how similar, aside from the removal of the royal imagery, are the stamps issued by the new republican regime, at least in its early years. There are similar commemorative series, for example in 1954 with stamps marking the evacuation of British troops from the Suez Canal Zone and 1956 with a special issue marking the nationalisation of the Suez Canal Company. There are also stamps marking anniversaries and centennials. Perhaps there is a greater emphasis on welfare and development, and there is certainly a far greater emphasis on Egypt’s regional role, as befitted a regime dedicated to the cause of Pan-Arabism. 1958 saw the overprinting of a series showing mostly Islamic scenes with the words “U.A.R. Egypt” after the union of Egypt with Syria to form the United Arab Republic and the change in Egypt’s name. Stamps were issued in 1962 to mark Algeria’s independence from France and in 1963 to mark the proclamation of the Republic of Yemen. President Gamal Abdel-Nasser does not seem to have appeared on Egypt’s stamps until 1969 in a series also showing ancient Egyptian and Islamic scenes. A memorial series was issued after his death in 1970. A country’s history and identity can be read off from its stamps, at least as far as its official history is concerned. Moreover, stamps can signal significant political and other watersheds, including changes of regime. They can help to indicate the events that were important to governments at the time, and they can signal the growth and disappearance of political or societal agendas, including, in the Nasser period, the growth of Pan-Arabism and Arab Socialism. Perhaps this explains why so many public figures have collected stamps, as they may well have enjoyed both the methodical pleasure of collecting and the surely equal pleasure of arranging and putting in order, allowing them to glimpse something of the stream of history as vice-royalty gave way to sultanate and monarchy (in Egypt’s case) before settling down into a republican regime. 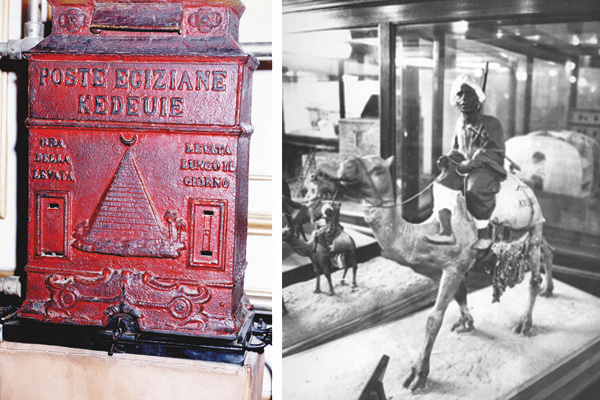 For these and other reasons, Egypt’s Postal Museum has enormous potential as a way of transmitting and illustrating the country’s history for present and future generations, as seen in the history of its stamps. It is to be hoped that as the Khedival Cairo Conservation Project advances towards Ataba Square, the historic Post Office building with its unique Postal Museum can also be suitably renovated.